This week’s guest post is by Jeremy Toomey. Jeremy heeded the call in an earlier post for submissions from places we have yet to cover, or needed to be covered more. And he delivered Iraq. If you have any interesting records or cassettes that you wish to share from some of the countries that we have yet to hear from – say like Bangladesh, Central African Republic, Kazakhstan, Libya, Somalia or Tanzania – or countries that we need to hear more from – like Laos, Sudan or Syria – please get in touch. In 1969, Ashur fled the unstable political situation in Iraq, ending up in Chicago, IL in September 1970. In 1971, he formed his first band, “East Bird Band”, which released its first recording in 1973. In 1976, after relocating to Los Angeles, Ashur became the first Assyrian artist in history to tour overseas when he and his band played three sold-out shows in Australia. Soon afterwards he would travel to Iran, which at that time had the second largest population of Assyrians in the Middle East, and had long been a large producer of Assyrian music on the record labels that flourished in Tehran in the days before the Islamic revolution such as Irangram and Monogram. After two weeks of performances there, he returned to Los Angeles to record his second album, “Ashur Sargis Sings for Ancient Assyria”, which included re-recordings of hits from the first album like “Tanilee Ly-Ly” (“Sing Me A Lullaby”, with lyrics by Assyrian nationalist martyr Dr. Freydun Atturaya) and “Bet Nahren”, as well as several other songs that have since become staples of his catalogue and concerts. The version of “Bet Nahren” posted here comes from this LP, released in 1978. Ashur Bet Sargis continues to tour (including a two week tour of northern Iraq in 1997 during which he gave five concerts which were attended by thousands of Assyrians from all over Iraq) and release albums from his current home in Phoenix, Arizona. For more on the life and career of Ashur Bet Sargis (including the biography from which this information is taken), please see the artist’s official website at http://www.ashurbetsargis.com/. For more information and examples of Assyrian music, past and present, visit the largest archive of Assyrian music on the internet at http://www.qeenatha.com/. Catalog number NIN-109 on Nineveh Records of San Francisco, California. No release date listed. Ja’afar Hassan (also spelled Jafar Hassan) was born in the town of Khanaqin, which is in the Kurdistan Region of Iraq. He learned to play the oud (Google translator: “lute autonomous machine”) at a young age. He later studied violin, viola and voice at the Institute of Fine Arts in Baghdad, where he later became a professor and head of the Department of Music. He has also played in neighboring Kuwait and Syria, as well as Yemen where he is a member of the Federation of Yemeni artists. There is almost no mention of this album on his website, except only briefly on the biography page (Google translator: “Cylinder issued to him in Berlin entitled ‘to enrich together’.”). Also on his website, there is a page of his press clippings, but there is a 11 year gap from 1966 and 1997. Also, there is very little information on the record itself. There is no indication of a record lable, but there is a catalog number. On the front cover, there seems to be something covering the right top corner, where the record company logo may have been and was printed over. 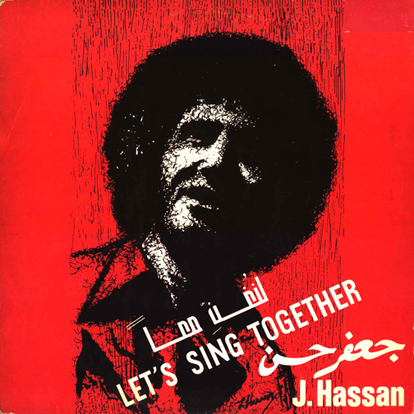 The record was most likely pressed in East Berlin, given that Hassan was supposedly a mouthpiece for the Iraqi Socialist movement just a few years before Saddam Hussein came to power. Also, the design of the almost all red cover and the sequence of the catalog number is similar to records from that time period. Which begs the question, who was the intended audience for this record? Was it released, or at least distributed, in Iraq? Or, perhaps was this release for Iraqis living outside of Iraq? Thanks to Mark Gergis for his help and information. Catalog number 8 95 012. No other information. 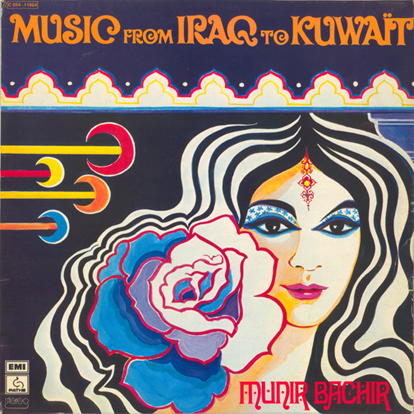 Munir Bachir was born in Mosul, Iraq in 1930, into a long established family of musicians. His father thought him to play the oud at a very young age. He then spent six years studying at the Baghdad Institute of Music, directed by Sharif Muhiddin. Later, he completed a doctorate of musicology in Budapest. He is most known for having created a completely different playing style of oud in Iraq, but also to that of other Arabian states. His style is composed of elements from Flamenco guitar playing, and also from the tradition of Western Classical music. Although I have read that Munir Bachir passed in 1997, I have also seen that he released a new recording with the Iraqi Traditional Music Ensemble (which he founded in 1981) that was released by Le Chant Du Monde in 2005. For some reason, this song is the only song on this album that actually has oud on it. Also, you can tell this record was an attempt to appeal to a different audience than traditional Iraqi music. Catalog number 2C 054 – 11.804 on Pathé Marconi / EMI, released 1974.